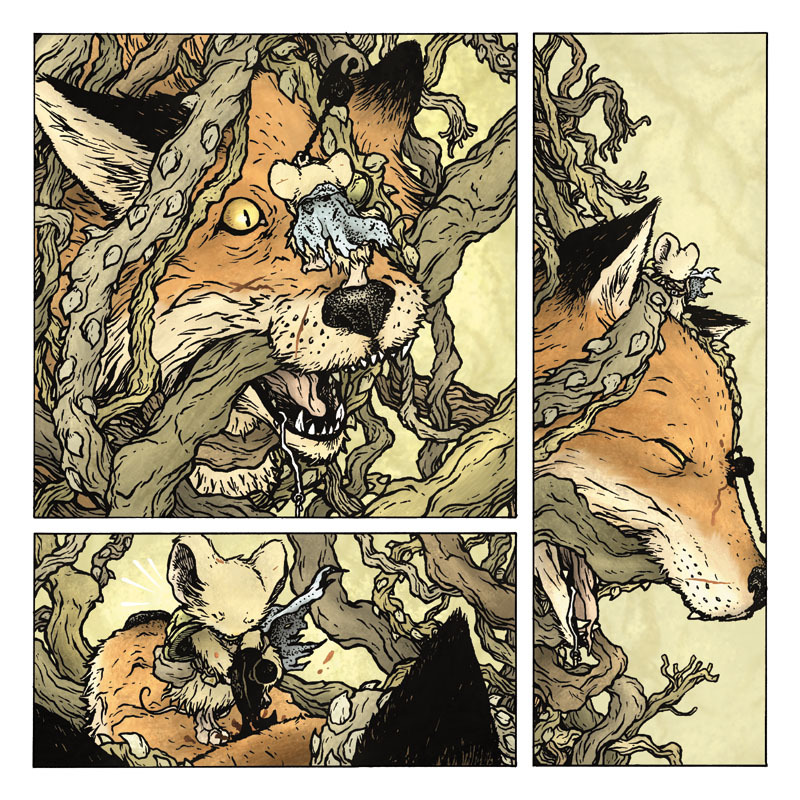 In this page Celanawe finally kills the Fox he's been sent to murder. 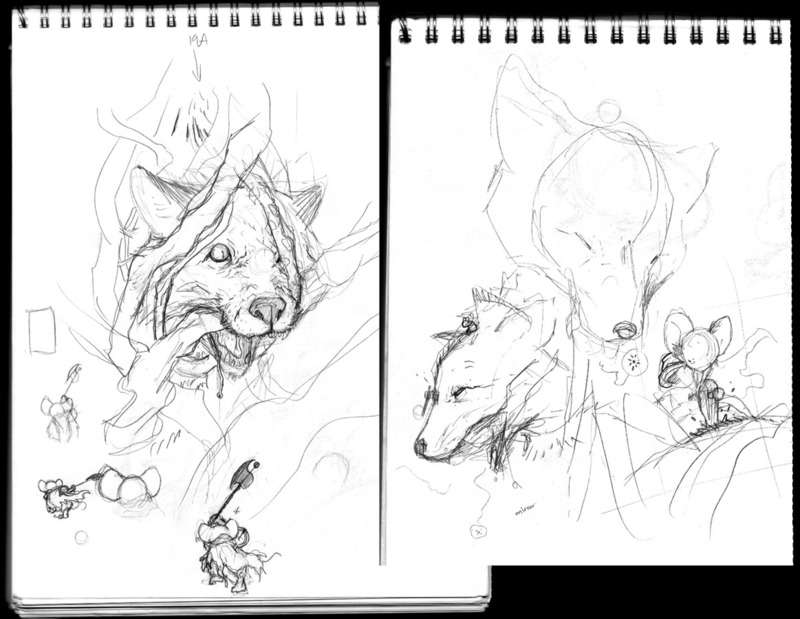 I started with these sketches across 2 pages in my sketchbook. I knew this scene would be broken into three panels: the anticipation, the death blow, and the calm after the storm. With the Black Axe such a big heavy weapon, I have to be visually careful when it strikes a foe. With a sword, I can minimize the gore of the strike and still have it be a believably dangerous wound, but with the axe, it's harder to hide the horror. As usual, I'm free forming little drawings that I feel tell a moment in the story. 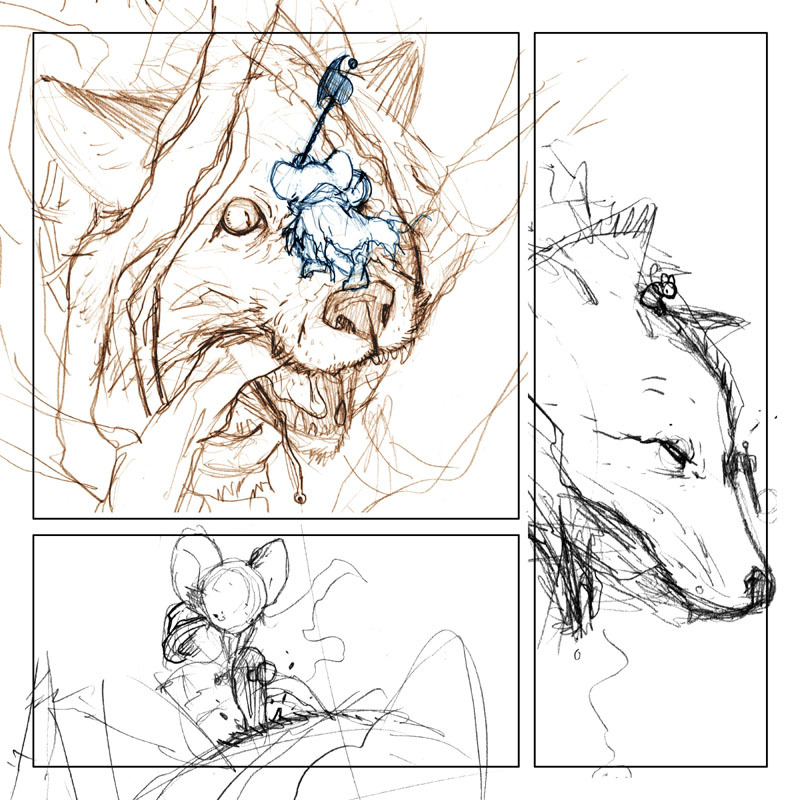 I'm not looking at panel shapes or layouts at this point, or at best, only vaguely aware of what shapes I'd like the panels to be, but letting the sketches dictate themselves at first. When the layout stage is all done and I've composited, resized, rotated, and mirrored all my sketches into the flow I want, I print them out at actual size. 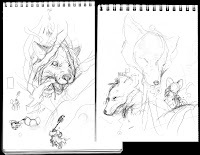 Using a lightbox (where I can see the printouts through the bristol board of the final art) I ink the page with the printed sketches as a guide. You will notice the vines are not as well defined in the sketches above. I save all of that for the inking stage. Some of them I will pencil directly on the page, but a lot of that comes out in spontaneous inking. Interweaving things at random intervals is something I can do on the fly. It looks complicated to some, but it really is just draw a vine for a bit and then stop to have another cross it. 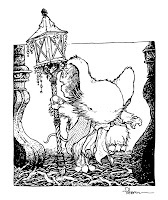 In the last panel, I left a bit of open space, this was a visual cue of the weight being off Celanawe for a moment, a brief respite for him and your eyes of the visual tangle I'd kept you in for so many pages. After the inks are done, I scan them and start the first stage of coloring called 'flatting'. 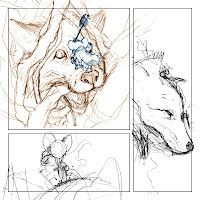 This is where you are establishing flat colored areas to distinguish one thing from another (the fox's head from her eye, Celanawe's fur from his cloak, or even one vine from another.) The character and background colors are all fairly close to the final colors because I was carrying over the palette from the previous pages, but for the briar, I used radically different colors. This was so I could see that I was getting a good distribution color value between the vines. If I started with them all vine colored, it may have been difficult to see if I had accidentally colored outside the lines of one and into another since the values are so close, but with red and green and yellow, it was easy to see that I stayed in my boundaries and didn't overlap too many of the same colors. 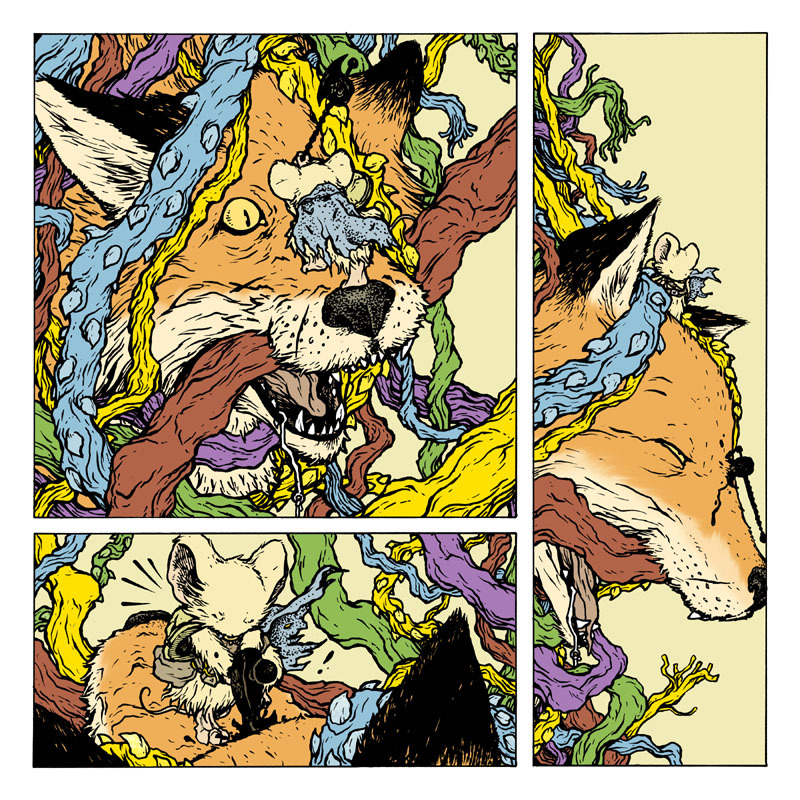 The last step for this page was to render (shade, texture, and highlight) the flat colors. I use the Dodge & Burn tools in Photoshop for this almost exclusively. 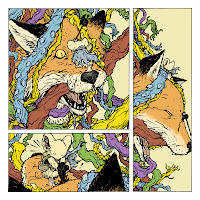 The briar tones were pulled in from a previous page, swapping each of the bright colors from the flats with five subdued colors. To get the thorns a lighter shade relative to the vines they are on, I made a layer with the thorns painted in and set it to screen. That way it just lightened whichever vine color was underneath it. 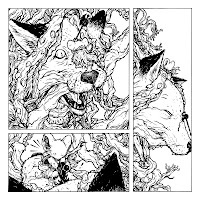 The vines in the far background of the last panel were painted in digitally and then smudged and blurred to allow that space to feel open but not blank. 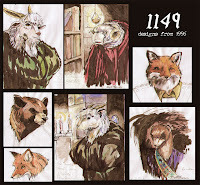 A Fox who got by in life by conning kings into thinking he was royalty, getting invited to their castles, and then making off with their treasures in the middle of the night. A tiger, who was a monk that had strayed from a religious path (in a violent rage fueled event) and became a wandering adventurer because he was no longer welcome at his monastery. A duck who was a grumpy butcher and was the most fearsome merchant in his village. A ferret archer who was exiled from every kingdom and lived in the wild. 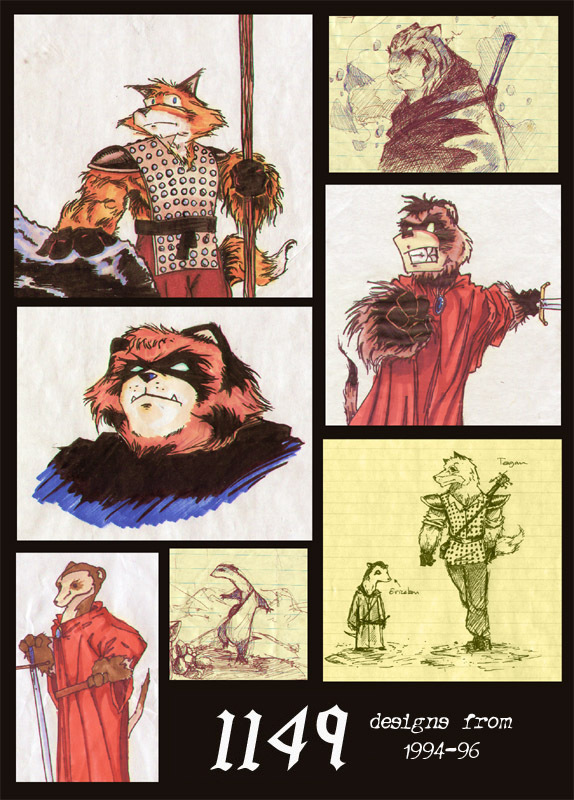 There was also a bear character, a rabbit, and an opossum who were never fully fleshed out. 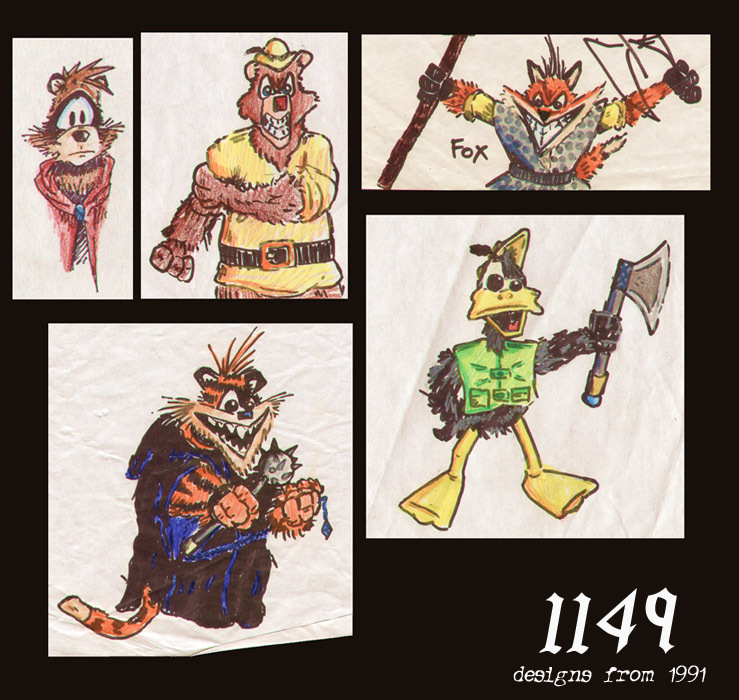 These drawings represent the earliest versions of the characters. 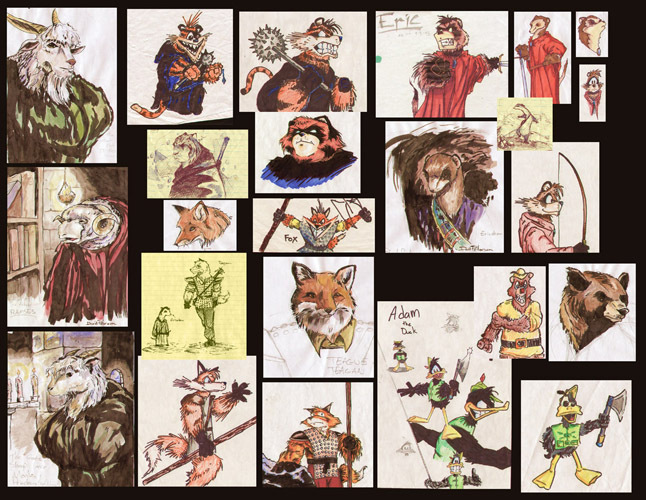 As high school went on, my friends and I would rotate duties on various comic projects we were dreaming up, but the next time I got back around to these characters, I honed in on the tiger, fox, duck, and ferret. They were going to be my main cast (I also planned on keeping the opossum at this point, but I can't find any drawings of her). 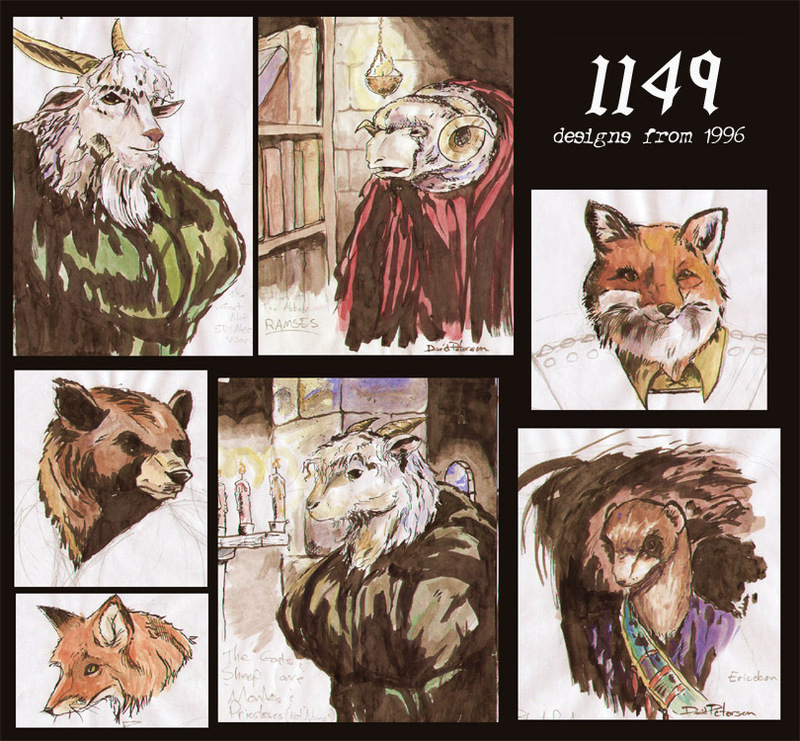 I was trying to draw these characters consistently (which is probably why most of these are drawn in profile, as though I was prepping to do turn-around model sheets), because that summer, I started drawing the first 8 pages of 1149 while on a summer trip. Unfortunately, none of those pages survive today. Towards the end of high school and into the start of college, I did another batch of re-designs on these characters. 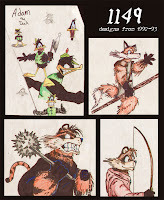 I was using new materials to draw and color with, and had learned from getting several false starts with comics in high school, that a streamlined design for the characters will only help you draw the story more comfortably. 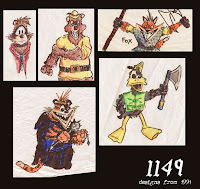 I think this was some of my first realizations about drawing like yourself being easier than trying to mimic other folks (even your friends) This was marked the last time I tried to draw them with the hopes of 1149 being a comic series. 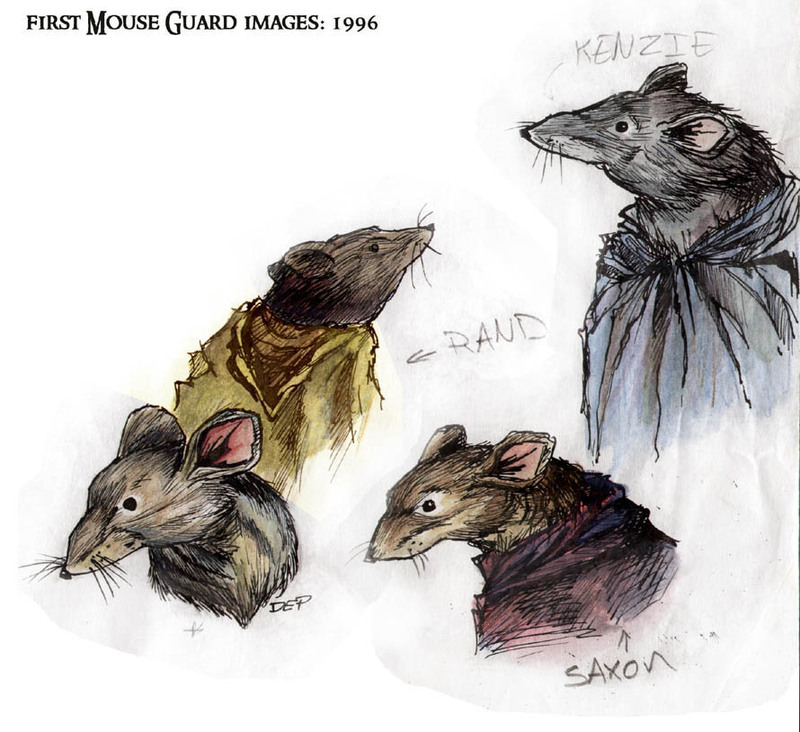 In 1996 I also drew three ranger-esque mouse characters for the novel I was starting to write. Saxon, Kenzie, and Rand represented myself and my friends Jesse & Mike. They also represented Sword, Wisdom, and Shield...or to put it another way, aggression, calm, and defense. 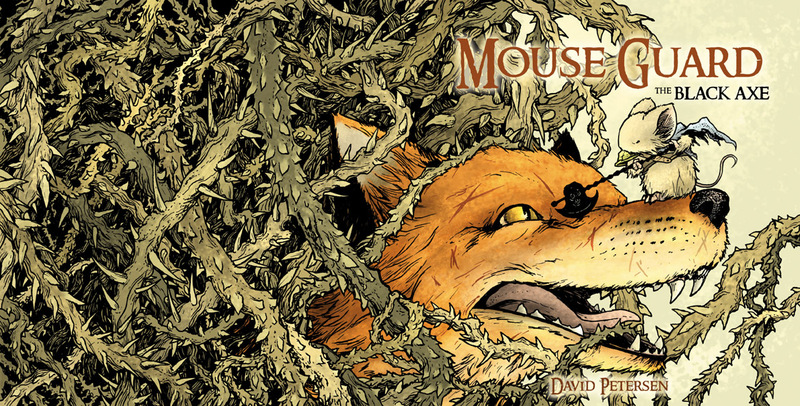 By developing what their group of Guardmice did, why it was there, and how it functioned, I realized the heart of this story had to be the mice. They were the ultimate under-dog, their struggle was more interesting and important than any of the other species. I dropped the idea of the predators as characters away, and kept them as races meant only to be the threat...of the Mouse Guard. 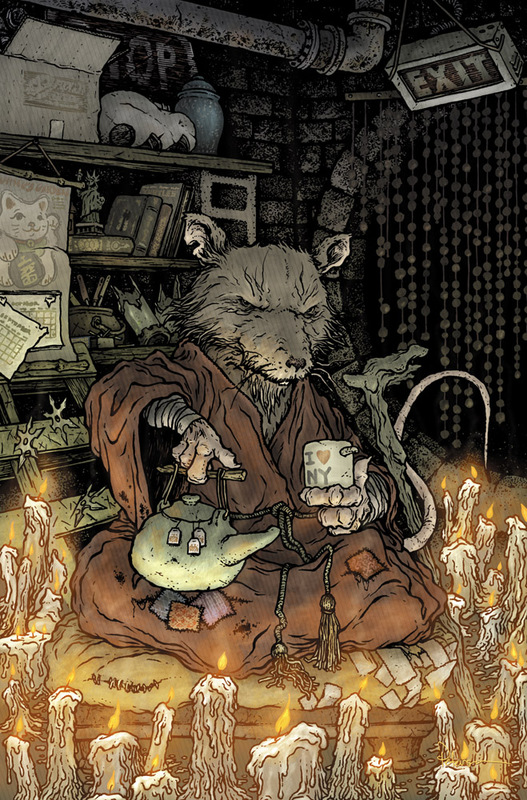 Starting at C2E2 this weekend I'll be selling new Mouse Guard tee-shirts. (This is a color mock-up, the shirts were not printed in time for the blogpost) There are already shirts available on CafePress, but I wanted to do a new design that was printed locally and that I could guarantee quality control on. 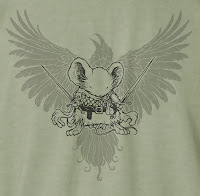 We will make these new shirts available for order through mouseguard.net at a later date. We should have the shirts at C2E2 (because we are driving there) but instead of bringing stock of the shirts with me to my other convention appearances, I plan to have a sample available, and then we will take orders at cons, shipping the shirts once we are home.Small, Medium, Large, & XL will be available for $17 each. I'll be reprinting this shirt if necessary to keep it in stock for a while, but my plan is to periodically introduce a new design after a print run starts to run low. To create the shirt's image, I did a new design based on my German print design. 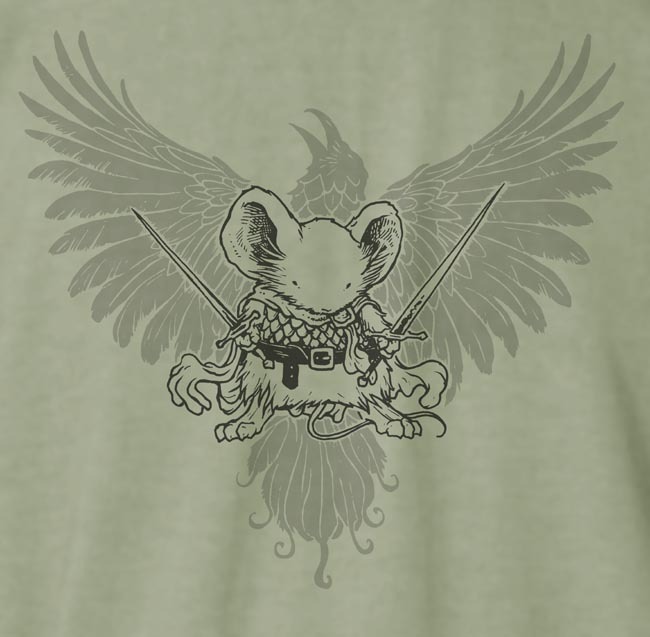 I didn't want to just re-use the German piece though, I wanted a mouse with swords and a bird behind him that held no meaning to real-world nations. 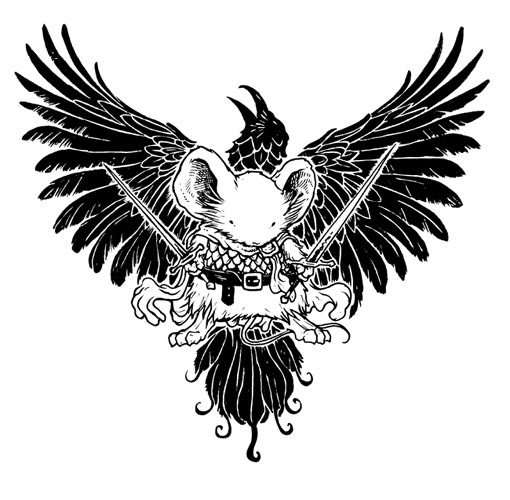 I drew the mouse and bird separately, scanned them to composite them into a single design, and then hand inked this artwork using a print out of the sketch composite as a guide. Then I scanned my ink work and prepared a digital file for the printer. 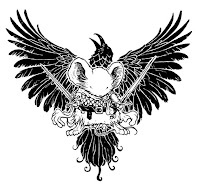 I wanted the mouse's inkwork to print one color with the bird printed a different color. I approached this the same way I approach color holds making a layer for the mouse and one for the bird. 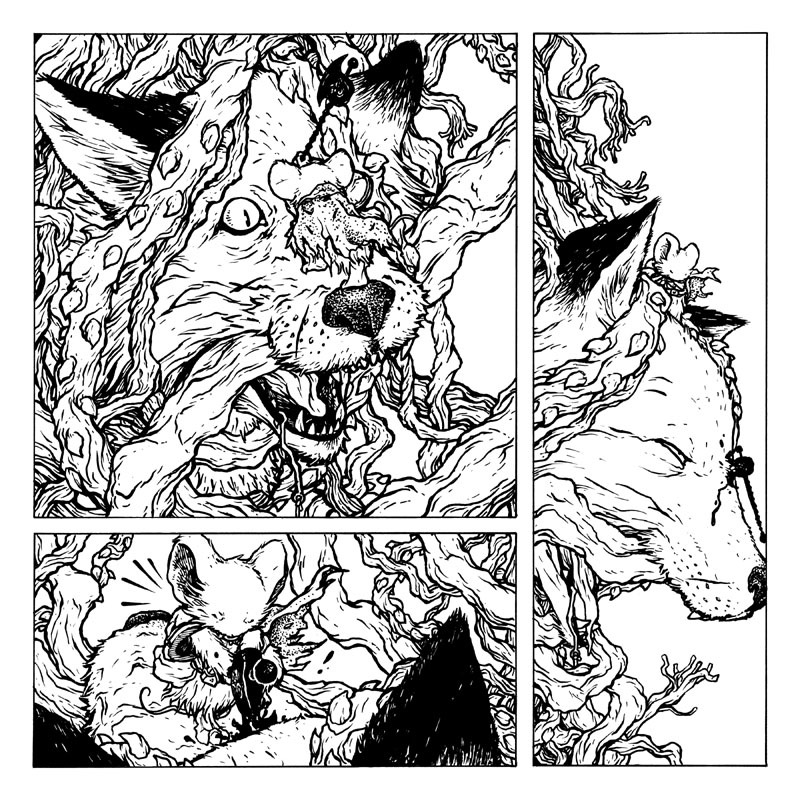 I deleted the original ink artwork scan layer so the separate mouse & bird layers are sitting on a transparency. To show that layer break down a bit better, I've made this diagram. 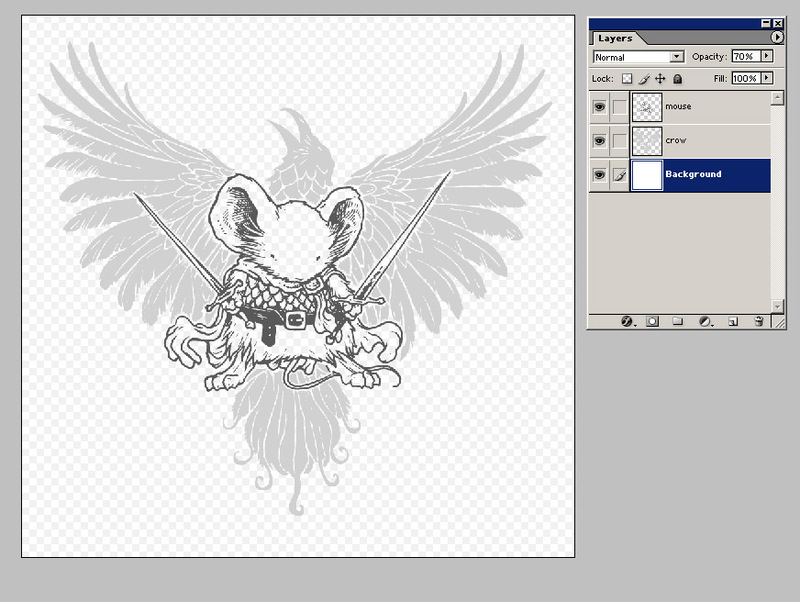 It shows that I only have 3 layers: 1) the mouse's outline, 2) the bird's outline, and 3 a background layer. 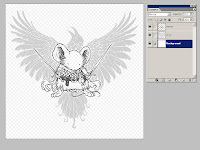 On the mouse & bird layers, there is nothing but their outlines, the space all around them has been deleted to transparency. While in London I did this piece for the C2E2 charity auction to benefit St. Jude Children's hospital. 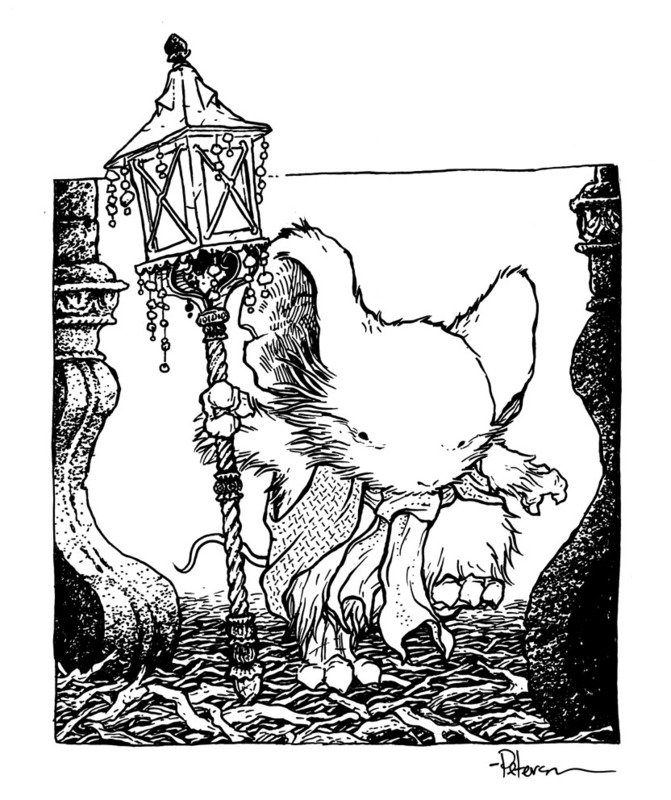 I did a Ustream brodcast as I drew and inked this piece from my London hotel room, looking out the window for design cues for the lantern and column bases, and now it can be yours! Here are the details on the auction. Happy bidding! As I hinted in my Leonardo cover process post, I got a chance to do more covers for IDW's Teenage Mutant Ninja Turtles Micro series. 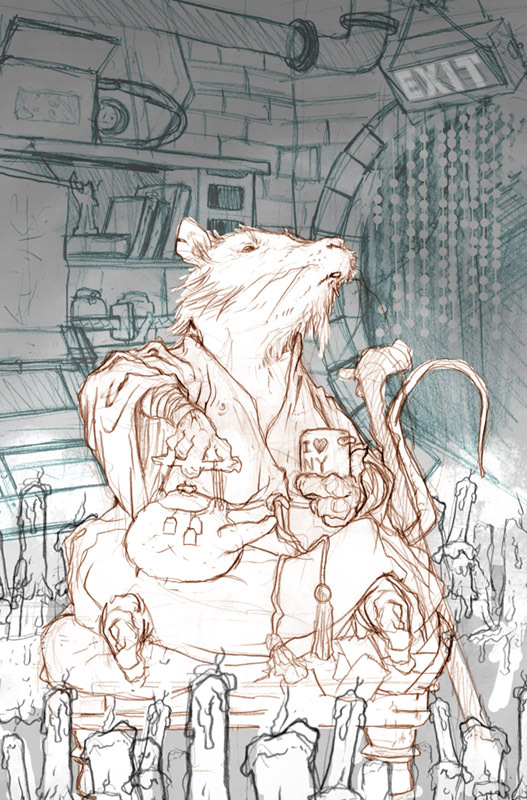 This time up, it's their mutated rat sensei Splinter. 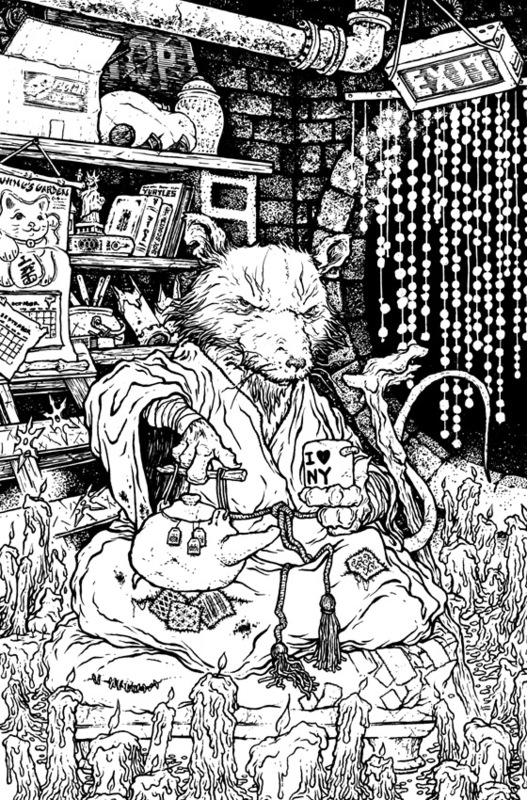 My goal was to show Splinter as a bit of a guru, a master in a zen calm in his dojo...except insstead of a nice dojo, it's a sewer chamber filled with found and trashed items, and instead of a martial arts master, it's a mutated rat in a robe. Taking the notes from IDW and Nick, I swapped out the head for one that had more age and wisdom to it and face forward a bit more. 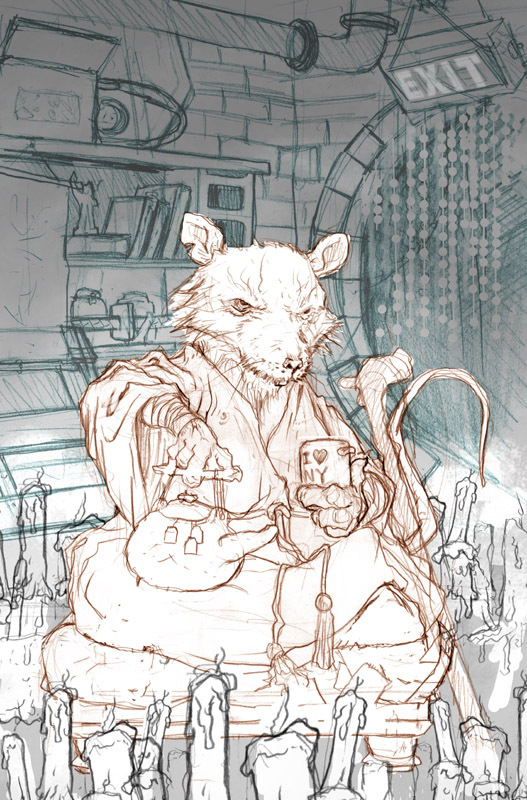 I edited out the feet, deciding to let Splinter's robe conceal his folded legs. I also lowered the stool he is sitting on to try and tighten up the space the candle glow would have to fill-in the gaps for. The background remained unchanged at this stage, but I knew that I wanted to make edits and changes to it as I moved forward. I printed out the rough with the adjustments at full size and layed a sheet of Strathmore 300 series bristol overtop of it on a lighbox. I can see my rough through the bristol as though the bristol was thick tracing paper. At this stage, I filled in some of the gaps of detail on the shelves including an old copy of a TMNT graphic novel, a boy scout handbook, the Black Axe, and an IDW turtles book. There is a broken Mouser head, and the broken ooze canister hanging out on the shelves too. To get the beaded curtain inked, I daubed dots of rubber cement on the blank bristol to form the beads. I inked over them and when the ink was dry, pulled up the rubber cement leaving perfect trails of dots. I used a brush and some white-out to form the strings that hold the beads together. The next step was to scan the inks and add flattened colors. As I've said before in past process posts, the goal here is to establish the areas that need to be different colors. I'm not worried at this stage (or at least I have to keep telling myself not to worry at this stage...)about the overall lighting and color choices, while I came pretty close to most of the base colors at this point, all I really need to do is organize the photoshop file so that the different areas are separate and easy to isolate for rendering and final color adjustment. 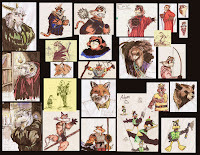 One color choice note here though, I opted for the 4 patches on Splinter's robe to match the colors of the bandannas the turtles had in the cartoons & movies (and were recently bestowed with in the IDW series). To the right is an animated gif you can watch by clicking on it showing the various layers being built up in the flatting process. Step 2 has the layer that ultimately is the the furthest back, but from that point forward, I'm working from the top down (each successive layer is behind the previous one). The last step is the final rendering. 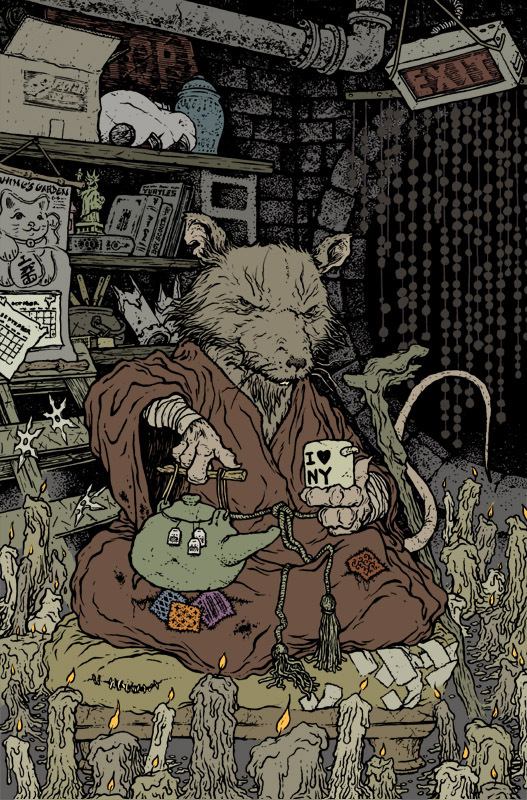 I've added special layers to color hold the linework, to add glows and smoke wisps, and to shade the background evenly as it goes to the top of the image. It was a real trick to get the candles to have the right amount of glow to get the background to desaturate and darken to the right amount (without losing the details I'd carefully added.